ISIS, Al Qaeda, extremism, beheading of people, terror. What is it that makes people commit atrocities in the name of their god? I have certainly no answer for this as I’m unable to imagine myself committing atrocities, even out of feelings of revenge and hate, if also I definitely know that like almost everybody else, I’m most likely able to kill in defense of my loved ones and myself. However, for all organized monotheistic patriarchal religions, there seems to be a moment of total craziness. Christianity had that moment in the Dark Ages when millions of people were slaughtered in the name of Christ who had predicated exactly the opposite. There are still tendencies to militant movements among Christians even today. My firm belief is that for how peaceful a religion basically is, the fact that it is taken over by an organized hierarchical structure that proclaims to be the voice of the Almighty, at some point leads to excesses, fundamentalism, extremism, and ultimately aggression and hate. Because humans are imperfect, and so are their institutions. An institution that represents the divine can’t be run by human beings. That is a contradiction in itself. Religion should be free and its rituals should be performed by the community that adheres to the belief system. Everybody should have the right to enjoy his people’s tradition, with his people. He should be taught to contemplate the beauty of Creation and to be thankful to whoever he feels is the Creator. Ultimately, everybody who worships the beauty of life and bows in front of the invisible reality behind it, venerates the same source, independently of which name he gives to it. With such worshiping comes the respect for life and an impersonal love for every creature. 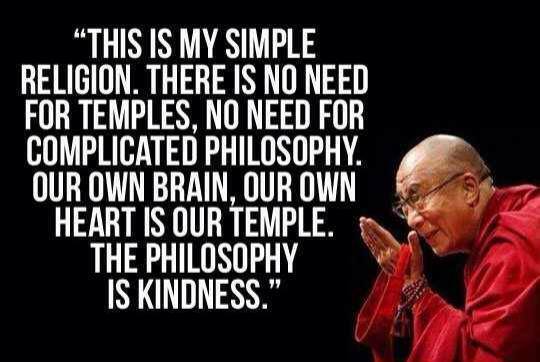 Until now, I’ve seen no religious institution that was actually able to teach these simple things and to give people the inner peace that is inherent to such state of mind. They all reach out for expansion and power, they all talk too much. All religions have it that we may find the divine through silence, in meditation or prayer. The inner path is the path.